Pesto’s been part of my life since an early age. My aunt’s amazing green thumb yielded more basil than you can imagine on her Brooklyn roof deck. I didn’t fall in love with it though until I was in my early twenties. What really inspired me to get to my Italian roots was a co-worker’s Italian husband. I’m talking born and bred in Northern Italy, so eating there was always a treat and very eye-opening compared to my Italian-American upbringing. 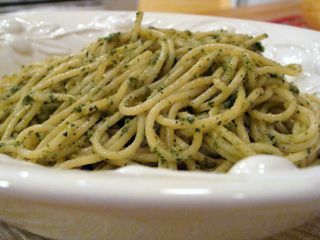 For the first time I experienced pesto that was creamy and delicately coated each strand of spaghetti. It was saturated in oil and didn’t have enough garlic capable of warding off vampires. Perhaps my journalistic skills weren’t honed then, or I was just too busy enjoying the food, but for whatever reason I didn’t ask Diego for his recipe. About two months later, I did find a book that would unlock the answers for me. I was roaming through a used bookstore in the North Beach section of San Francisco and came across a copy of Northern Italian Cooking by Francesco Ghedini. Turns out the book was published the year I was born, so 1973 had a couple of good things cooking back then. The secret had been revealed. I’m convinced butter makes everything better, and it’s certainly the case in this pesto. It lends a creamy texture and flavor. 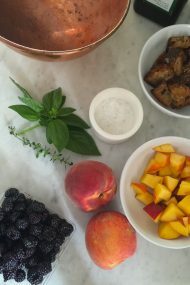 While this recipe was inspired by Ghedini’s it is my own unique blend. I used parsley instead of spinach because that’s what I had in the garden, and cut back a lot on the garlic—my tummy likes it better that way. Feel free to let loose and and more if you really like a garlicky bite. Ghedini also included Fiore Sardo in his recipe, an Italian cheese with a wonderfully nutty taste that I’m sure would be a good compliment to the pignoli nuts. I used the Parmesan I had in the fridge. And remember, a little goes a long way, so add just enough to coat your pasta. This classic Italian sauce is delicious served over pasta or drizzled over fresh mozzarella cheese and sliced tomatoes. Serve it slightly heated or at room temperature. I find adding the garlic in slices, rather than the whole cloves, ensures it blends into the final sauce better. 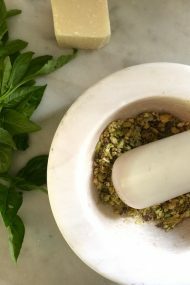 Add the basil and parsley to the workbowl of a food processor. Pulse until roughly chopped. Add the garlic, butter, nuts, cheese and salt and pepper. Process until it forms a paste, then slowly drizzle olive oil in through feed tube, continuing to process the mixture until it begins to emulsify and becomes a creamy sauce-like consistency. 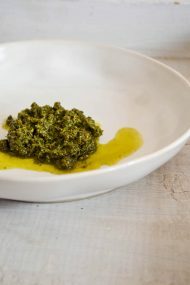 TIP: At the end of summer, I make a batch of pesto using any surplus basil and freeze it in ice cube trays. 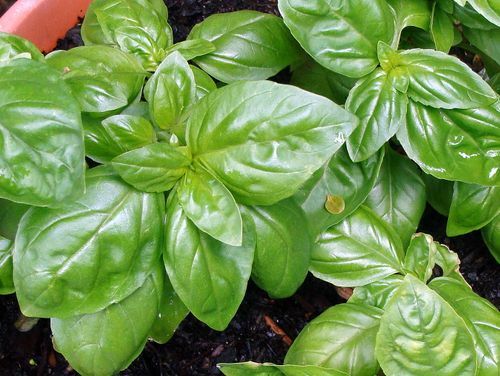 This way I have "fresh" basil to add to my marinara sauce throughout the long, sometimes cold, winters here in NYC. You can leave out the pignoli nuts, as I do, for this purpose. There's always room for one more at any Italian table. I know my Twitter pal Gina von Esmarch would agree (and one day I will make it to hers' in San Francisco). 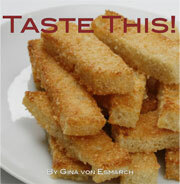 Gina has a wonderful cookbook of friend and family favorites she's collected over the years, and she's giving one away a copy of Taste This! to a lucky reader of In Jennie's Kitchen. Whadya have to do to win? Good question, and thanks for asking. Take a trip to Gina's cyber kitchen over at Bowl Licker and leave a comment here telling me the star ingredient of her dessert, which is perfect for the upcoming July 4th holiday. Contest ends 11:59pm Friday, July 3rd and the winner will be chosen using random.org. Good luck! If you feel inspired to make a contribution to support the work that goes into developing quality recipes and writing with sincerity and honesty, you may do so by clicking here. Deepest thanks and gratitude for letting me into your homes and hearts through my recipes and essays. Get the latest posts, bonus recipes & more! I must admit, I am typically not a big fan of pesto. Yours sounds delicious, though, and I have an overabundance of basil in my back yard. I think I will give this a try! I love how you dressed up this delicious post with your pictures. I just made pesto this past weekend and made mine into a bow tie pesto grilled veggie salad. 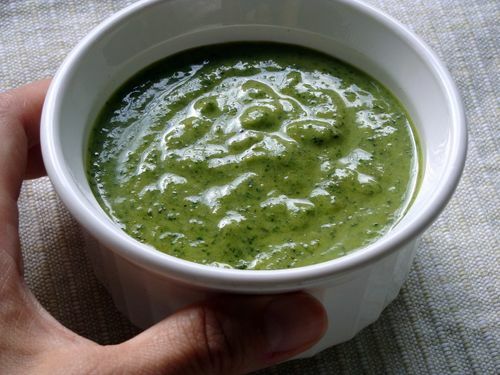 There are so many things you can do with Pesto and to me this is truly the taste of summer! Fabulous. We are huge fans of pesto. I’m so excited to have a recipe now to make it. Thank you.